Heat griddle or skillet over medium heat (375°F). Brush with vegetable oil if necessary or spray with cooking spray without flour before heating. In medium bowl, stir Bisquick™ mix, warm water, peanut butter, granulated sugar, salt and egg with whisk. Fold in chopped banana. For each pancake, pour 1/4 cup batter onto hot griddle. Cook 2 to 3 minutes or until bubbles form on top and edges are dry. Turn; cook other side until golden brown. 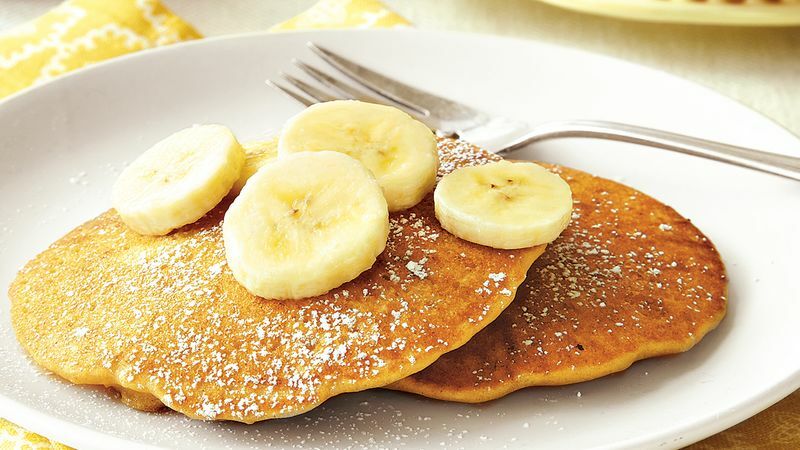 Top pancakes with sliced banana; sprinkle with icing sugar. For tender pancakes, mix just until dry ingredients are moistened. There may still be lumps in the batter. Keep pancakes warm in a single layer on paper towel-lined baking sheet in a 200°F oven. Gluten Free Tip Always read labels to make sure each recipe ingredient is gluten free. Products and ingredient sources can change.